This review is a special Rose City Comic Con edition. The book I am reviewing was only available for now at the con itself. Though it will probably be available through other avenues in the coming days. 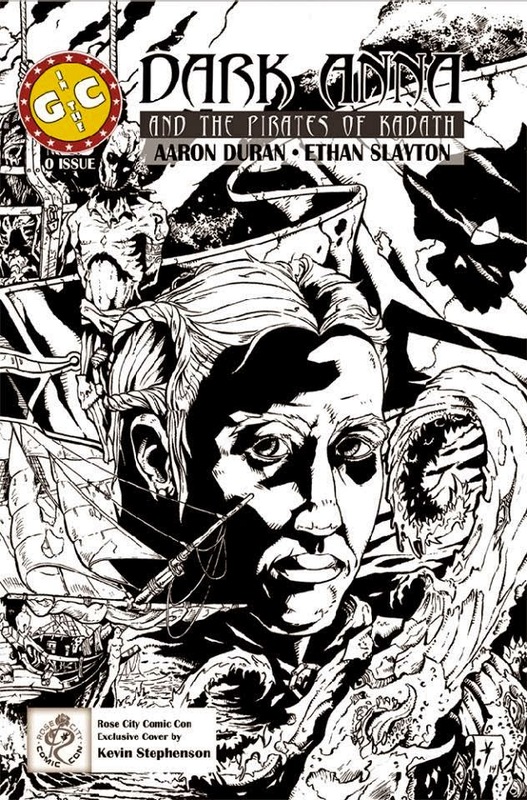 This comic was released as a Rose City exclusive by the creators Aaron Duran and Ethan Slayton with a special cover done by the original artist for the book, Kevin Stephenson. The story is an interesting mix of high seas pirate adventure and H.P. Lovecraft mythology. I recently started dabbling in the writings of Lovecraft, but I am not completely familiar with all of his stories. This makes it interesting, yet a slight bit confusing. The book focus’ on a pirate captain named Anna, who commands the crew of the ship Snabba Hamnden. They sail the Baltic Seas, which are filled with Lovecraftian creatures. And it is made clear that Anna and her crew show no quarter to any who are targeted by their crosshairs. It begins with some really good narration that gives you a little backstory on the world and the Snabba Hamnden, imposed over images of the sea and a ship chase. The chase and ensuing battle doesn’t last long, and soon Anna’s crew have boarded their query. From the first panel that Anna appears you can tell she is a strong female who takes no crap from anyone. And that if you cross her, there is very little chance for forgiveness. You get a little flash of what happened in Anna’s past to make her who she is, but it isn’t a lot. Just enough to get you interested. And by the end of the issue which is only 9 pages you get a teaser of where the story will be going. The characters all have strong voices that Duran manages to get across with only a little bit of dialogue. And it is clear that he has a good handle on where he wants to go with the story. The art is black and white, which builds the darkness pretty well, but it makes it hard to discern some aspects of the book. Especially when it comes to the crew of the ship that Anna captures early in the book. They are clearly supposed to be creatures of some kind, but I can’t tell for sure if they are Cthullu beasts or some other Lovecraftian creature. The art could have really benefitted from some color or even just a little more subtlety with the balance of black and white with the inking.. But it is very understandable why it is black and white considering the cost of color printing. And since the issue was released independently the cost was purely on the creators. It was a good issue, that caught my interest. But I wish the art were a little clearer at points. That said I am fully on board to check out the next issue. And I am actually anxious to see it. I have full faith that their quality will only get better with the every issue. Thanks for reading my review for Dark Anna and the Pirates of Kadath. If you are interested in checking it out I will post a link to where it can be found when the creators give more information. But if you would like to read something by Aaron Duran you can buy the first issue of his other book La Brujeria on Comixology. Or all four issues can be found on www.Drivethrucomics.com.